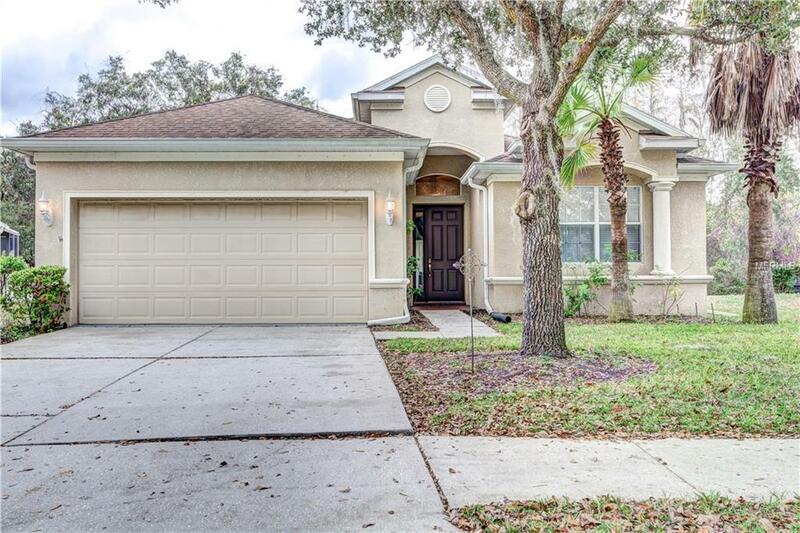 Welcome to the beautiful Suncoast Lakes; come see this spacious open floor plan home with an amazing conservation view! This home offers 3 bedrooms and 2 baths; the 3rd bedroom can be used as an office. The inside has hard floors throughout with tile and laminate wood. The kitchen has plenty of storage area with the many cabinets and walk-in pantry. Also, the high ceilings is a great feature with can lighting as well. The kitchen has a good size bar-top which can fit 3 bar-stools comfortably. The rear of the home is equipped with an enclosed screened-in patio area with nature views, perfect for both entertaining and/or relaxing. The master bedroom is a great size with his and her closets. The master bath features a marble, double sink vanity with a designated makeup area. The garden tub is perfect for relaxing and extended tile in the walk-in shower area is a nice upgrade. Low HOA and NO CDD fees yet offering many added amenities for its members including; a wonderful neighborhood park/playground, picnic areas, soccer field, basketball court, tennis court, newly updated clubhouse/community center and community pool area to enjoy with awesome lake views. The home is nestled in a private rural setting with easy access to the Suncoast Parkway and US 19. Close to historic Tarpon Springs, the Gulf of Mexico beaches, transportation, restaurants, shopping and short commutes to the entire Tampa Bay Area with all that it offers its residents. Don't delay, schedule your showing today!